In the process of producing this year’s ranking, four young NGOs stood out for their out-of-the-box thinking and willingness to dream big despite modest beginnings. While it is still too early to gauge the true impact these organizations will ultimately have, each impressed us with their innovation and long-term view. Though markedly different in the thematic space they occupy, Code For America, Child & Youth Finance International, Skateistan and the Akilah Institute For Women are all NGOs with a bright future. 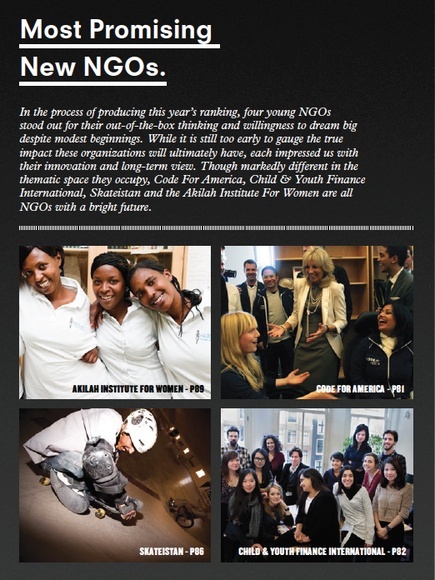 Get full access to the Top 100 NGOs.